This is a pin celebrating Disneyland's 50th Anniversary. 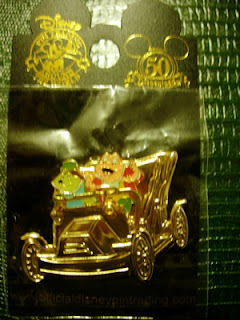 This was the first pin in the eleven pin series of the "Golden Vehicles Collectiion". It features Mr. Toad and Mole in the golden ride vehicle from the "Mr. Toad's Wild Ride" Attraction at Disneyland (this ride was one of the eleven original rides at Disneyland when it opened).